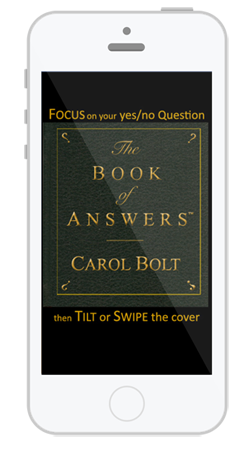 The Book of Answers™ App created by salty snack studios is now available in the iTunes App Store. 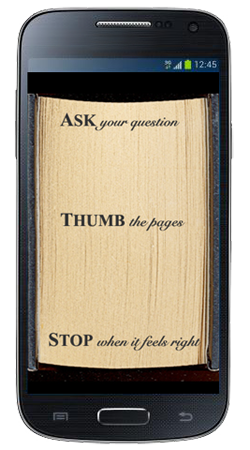 The Book of Answers™ App distinctively combines the sensibility of a book with the enjoyment of a game. It’s simple to use with handsome imagery and convincing sound effects. Unique among book readers and game apps, The Book of Answers™ App has hundreds of astute answers for unlimited questions making it an interactive guide for personal reflection or a dynamic interface when socializing among new or long-time friends. Like the original Book of Answers™, the Book of Answers™ App draws on the ancient wisdom of bibliomancy, the art of fortune telling through using a book. It is a divination tool that provides guidance to any yes-or-no question you may have. Among many accolades this book has kindly been referred to as “being cheaper than a shrink and easier than asking all of your friends for advice”. The Book of Answers™ Android App created by salty snack studios is coming to Google play. Available now for Android Mobile devices to Google play. 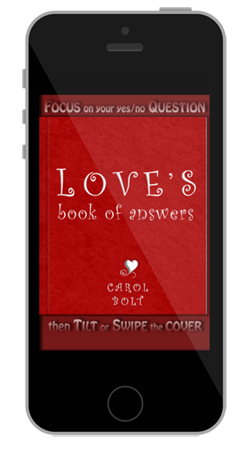 Love’s Book of Answers™ App created by salty snack studios is now available in the iTunes App Store. The latest edition to “THE BOOK OF ANSWERS”™ series is the “LOVE’S BOOK OF ANSWERS”™ App. Designed to help those who have been THROWN BY or are in THROES OF love. This truly insightful app draws on the ancient wisdom of bibliomancy-the art of foretelling the future using books. “Is it a good day to make a pass at my brother’s best friend?” Consult the app, will it offer “it’s gonna be sweet” or maybe “You could be in over your head”. There are hundreds of answers to discover in this terrific ice-breaker and an option to share them on FaceBook! How the app works: While asking your yes/no question, concentrate as you thumb through the app’s virtual pages. When you sense the time is right, stop and the app will reveal your answer. Repeat the process for as many questions about love that you have – and who doesn’t have thousands of them? Option to post your answer to Facebook. Sensibility of a book with the enjoyment of a game.